This is a stunning lace gown from Stella York in café with an ivory lace overlay and a flattering sheath fit. This dress is handcrafted with stunning detail that stands the test of time. This Lace over Lustre Satin sheath dress from the Stella York wedding gown collection features beautiful vine shoulder straps, a low back with a zipper closure, and a sweep train. You’ll love how the Lace embroidered bodice hugs your curves, while the V neckline frames your face. I will include my veil with the purchase of the dress. It was simple but just the right touch for this beautiful dress. I absolutely loved this dress and felt amazing on my wedding day! I hope that someone else can use it and feel just as amazing! 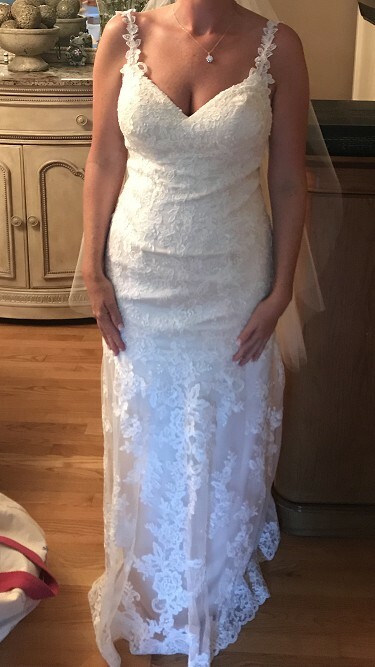 I dropped down a full size before my wedding so this dress has been altered from a label size 12 to a size 10 with my measurements and street size listed below. It was taken up in length as well, I am 5'5" and wore flats, the dress touched the ground perfectly at this length. A bustle was added but it looked perfect like it was part of the original dress design. Significant cups were also added but can be easily removed. The only sign of wear is on the underlayer of the satin where it is slightly "fuzzy" from when I walked down the aisle but you can't see that since it is on the inside. Other than that, the dress is in great condition! Label size: 12 Street size: 8 Bust: 36.5 Waist: 28 Hips: 39.5 Height: 5' 5"
Once you send a message, Terra can invite you to purchase the dress.